↑ Landler, Mark (20 December 1999). "Portugal Lowers Its Flag, Handing Macao to China". The New York Times. https://www.nytimes.com/1999/12/20/world/portugal-lowers-its-flag-handing-macao-to-china.html. अन्तिम पहुँच तिथि: 5 July 2018. ↑ Branigan, Tania (11 May 2011). 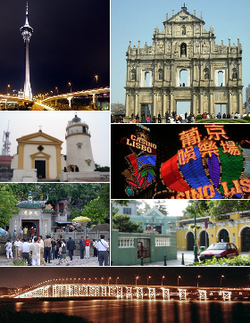 "Macau – gaming capital of the world". The Guardian. Archived from the original on 30 July 2017. https://www.theguardian.com/travel/2011/may/11/macau-gambling-capital-of-world. ↑ "Macau: The world's gambling capital". BBC News. Archived from the original on 30 July 2017. https://www.bbc.com/news/av/business-23355582/macau-the-world-s-gambling-capital.